This book is also available as a Kindle edition (please note: you don't need a Kindle reader to view this book - you can download it onto your computer as well). 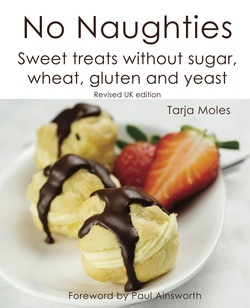 No Naughties contains over 50 mouth-watering recipes from super quick snacks to more elaborate desserts and cakes. You can find breakfast ideas, lunch-box fillers, delicious desserts, sumptuous suppers, afternoon indulgencies, fruity favourites and delightful drinks for every day of the week. The recipes have numbered step-by-step instructions which makes your treat making simple and straightforward. They are also accompanied by a 'free-from' list, showing from which 'naughty' ingredients they are free. In addition to the recipes, you can find information on the ingredients, where to buy them and how to use them successfully. No Naughties shows that making ‘free-from’ treats is easy and can be done by anyone. Multiple food intolerances don’t have to mean a boring diet. It’s perfectly feasible to prepare and enjoy delicious treats – and inject some sweet magic into your life! "I would truly recommend this book if you're after recipes that work and sweet treats that taste great." "Exotic. It is indeed a treasure-house of recipes!" "This book is perfect for dessert ideas because each recipe clearly states which foods it is 'free from', and then offers further substitute and alternative ideas." "I love these recipes - clear, simple and imaginative. A welcome change from the usual recipe-book selection."